Weights will be in 5lb. increments for each division. *Wrestlers weight will be determined by scratch weight. If the wrestler is 50.1 pounds at weigh-in he/she must be faxed in at he 55 pound bracket for his/her division. You can register at the first practice. Forms are located on the "registration" tab. 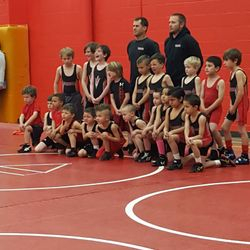 Registration fees are $54 per wrestler and we offer scholarships for qualifying families, inquire at the first practice or early registration, a COPY of athletes birth certificate is required for registration.